Free-agent cornerback Jimmy Williams has been suspended for a full year. The suspension apparently arises from his latest violation of the league’s substance-abuse policy, according to Howard Balzer of the Sports Xchange. Yes, considered to be the most overrated player in Virginia Tech history (by your humble editor, anyways), Jimmy Williams will now have an excuse as to why he’s not covering anybody. No, pumping up the crowd did not count as a valid reason. Chances of the Falcons ever drafting a Hokie again? About the same as the DiP posting anything funny. Looking at this article on NBCSports.com, it lists the top few NFL bust by school and then lets you vote on who you think is the top NFL bust. 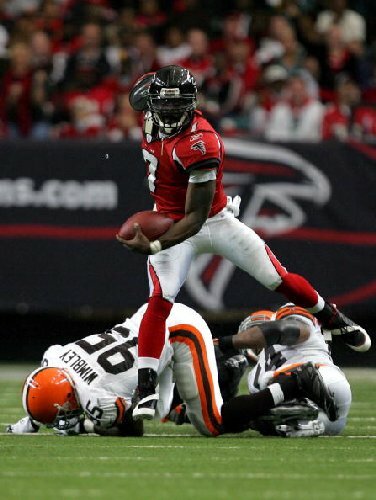 According to the 283 votes at the time I viewed the page, it was concluded, overwhelmingly, that Michael Vick was the biggest bust to come out of VT.
Now, if the question was: who was the biggest waste of talent that got involved in a disgusting extra-curricular act, then yes I would vote Michael Vick. But when compared to EVERY other player in the list, whose “bust” level was based on performance in the NFL and Vick’s “bust”ness was based on the fact that he is in prison, and not on how he performed in the NFL, I feel like he doesn’t even qualify as a bust. 3. The missed playing years are not due to poor performance or injury, but rather being an awful human being. Case in point: Ricky Williams and Ray Lewis were not considered “busts” by this article and yet both lost playing time for non-football reasons. And Ricky Williams is definately not the back he was in college. I’d like to hear what the arguments are for this one, so as always, post in the comment section. Is Michael Vick the biggest bust from VT? Editor’s note: Vick got 68% of the vote with Jim Druckenmiller coming in second with 21%… it wasn’t even close. You are currently browsing the archives for the Jimmy Williams category.